James J. Maher (1863 - 1935) was one of the top racehorse breeders of his generation. He carries the distinction of having bred two Grand National winners (one a "Wartime National" winner) and a winner of the Epsom Derby, as well as winners of other classic races in Great Britain -- the St. Leger and the 2,000 Guineas -- not to mention the Irish classic races, all bred in his native Ireland. Unlike his younger contemporary, the Italian breeder Federico Tesio (1868 -1954), his name does not spring to the fore when "great" racehorse breeders of the past are mentioned; he did not breed a Nearco or a Ribot, or any horse that could be granted the status of breed-maker in the sense of those two cracks. And yet, working from a very small band of broodmares he was usually in the top ten list of British breeders of flat-running racehorses by earnings, and even more frequently in the top ten list of average and total yearling sales prices at Doncaster and Newmarket. We find the bloodlines J.J. Maher developed in the first third of the twentieth century in good racehorses today -- Manna; Sandwich; Royal Minstrel; Parwiz, who was an influence at stud in South America; the good race filly Qurrat-al-Ain, granddam of Gallant Man and Masaka, Poona II, and ancestress of other top horses; Lady Comfey, the dam of American Flag -- were all bred by Maher at his Confey Stud at Leixlip. In addition, Tesio himself purchased Maher-bred horses at the Doncaster sales, and not inexpensively, among them the dam of Italian classic winner Bernina and ancestress of Brueghel and Bozzetto, the latter a leading sire in Italy. Maher also bred and developed a significant branch of a family of Irish mares that produced several generations of top 'chasers and hurdlers, and was a leading breeder of jumpers until he focused his talents on breeding flat racers. The literature on Maher's breeding operations is scant--he is often mentioned in passing, but seldom in detail. He appears to have been a horseman's horseman, highly regarded by many associated with the racing world, from authors Abram Hewitt and Stanley Howard, to the Aga Khan, who purchased a number of his yearlings at very high prices at auction. Maher kept a relatively small band of broodmares, both when breeding jumpers and later, when he switched to breeding classic winners. His penchant was to purchase inexpensive mares, although not necessarily poorly-bred ones, and send them to high class stallions. Although he started as a steeplechase rider and trainer, only the first third of his career as a breeder also involved the schooling, training and racing of his homebred jumpers, many of whom he also hunted. When his flat race breeding operation got underway, he seldom ran any of his horses himself, selling many as yearlings at the major sales--both the later jumpers and subsequently, the flat racers. The best of his homebred fillies he retained for use in his stud. He developed his own theories regarding breeding racehorses, and methodically pursued them through several generations of mares. Maher grew up with horses, eventually serving as manager of his father's farms, and training and riding his own horses in steeplechases. He stopped riding in races around 1897, at the age of 29, when he gave up his battle with his weight. As a 'chaser rider one of his principal feats was winning the Ward Hunt Cup four times. As a 'chaser trainer he established the principal jumper training stable in Ireland at Williamstown, near Dublin. In the early and mid 1890s, Maher had a partnership with another legend of the Irish turf, R.C. Dawson; just before moving to Berkshire in the late 1890s, Dawson purchased Drogheda in partnership with G.C.M. 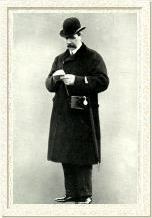 Adam, took the horse to England with him, and trained him there to win the Grand National of 1898. Dawson's name is now more associated with flat racing, having purchased a brown yearling by Swynford in 1920 at the Newmarket December sales, subsequently training him to wins at ages 2 and 3 and retiring him early to stud at Cloughran Stud in Co. Dublin, Ireland, which Dawson owned with his brother. This colt, with the short-lived racing career, was Blandford, the leading sire of his generation, who got four Epsom Derby winners, of whom Trigo, Blenheim and the wartime winner Fifinella were trained by Dawson, making him the first trainer to produce winners of both the Grand National and the Derby. Another Irish legend associated with Maher was H.S. "Atty" Persse, a member of the Galway distilling family, who rode Maher and Dawson's jumpers. In 1906 Persse moved from Ireland to England and in 1912 bought and trained the unbeaten "spotted wonder," The Tetrarch, later a highly significant sire of early speed horses who stood at Mount Juliet in Co. Kilkenny, a stud owned by Persse's cousin, Maj. Dermot McCalmont, to whom The Tetrarch had been sold. Persse also subsequently trained four classic winners in addition to many top handicap horses. In addition to Ballymacad and Covertcoat, the Grand National winners Maher bred, he also "developed" Wild Man from Borneo (1895 Grand National winner), who he had purchased as a foal with his dam, Wild Duck (one of his Ward Hunt Cup winners (1890), later sold to Germany); Wild Man from Borneo was schooled by Maher to place third in the Conyngham Cup of 1893, and second to Father O' Flynn in the Joliffe Chase at Liverpool that year; he was sold to John Widger, his owner when he won the National. Maher also purchased and "made" the 1910 Grand National winner, Jenkinstown, who he sold to Stanley Howard, his owner when he won the National. Around 1905 Maher began the transition to breeding for flat racing, and in 1907 he purchased the 200 acre Confey Castle estate at Leixlip, and started to breed for the flat in earnest. He retained the Williamstown stables until 1911, when he shut down the jumper training operation. For more detailed information on his jumpers and flat racers and their breeding, refer to the relevant sections in the links at the bottom of this page. Maher's breeding plans, like the plans of many in Great Britain during the teens, were to a great extent put on hold, due to the outbreak of World War I. Although he bred some horses during that period, much of his time between 1914 and 1918 was spent in Canada and the U.S., where he served on the British Army's Remount Commission, one of a number of buyers of "...repute and integrity and knowledge of horses, who acted in an honorary capacity; They comprised well-known breeders and trainers of horses, well-known judges at horse shows, landed gentry, masters of foxhounds, and others who were in a position to know a good horse when they saw one and the price of it. " Hundreds of thousands of horses were required to fuel the war effort--infantry, artillery and cavalry -- and although around 150,000 were purchased or comandeered in Great Britain, the government soon sent the Commission overseas to purchase horses, beginning in Montreal and soon spreading to the stockyards of America. Buyers such as Maher often contacted breeders directly, arranging for horses to be shipped to central stockyard locations for veterinary assessment and soundness evaluation. Each horse was examined by a buyer, a commissioner, and a vet, and if passed was branded with the arrow of the British government, as well as the initials of the buyer. They were then forwarded on to a British depot and quarantined for several weeks before shipment by rail to a seacoast port where they were later loaded on ships bound for Britain. Over half a million North American horses were purchased by the Remount Commission for the British war effort. During this period Maher did breed some horses for flat racing and sent youngsters to the sales, which continued throughout the war. His first classic horse, Caligula, who won the St. Leger, was sold as a yearling at Newmarket September in 1918, two months before the armistice. Maher's strategies for thoroughbred breeding success, whether jumpers or flat runners, seemed to hinge on three principals: 1--Breed to the best stallions available; 2--Recycle the broodmare band every several generations; 3--Raise youngsters as naturally as possible. Except for the latter, he appears to have veered occasionally from these precepts, but the overall pattern is clear. He favored Hackler (Albert Victor - Cecily Hacket), with his prized Melbourne blood, his conformation and way of going, and success as a sire both of jumpers and flat racers for his 'chasers; Hackler led the list of jumping sires for a decade, due in no small part to Maher's youngsters' contributions. For Maher's flat racers, he consistently chose the very top sires of his day for his mares, often before they had made their reputations --Phalaris, Sansovino, and the Roi Herode line, the latter apparently particularly appealing for speed--were favored, but he selected a number of other classic winners as well. He would try mares with different stallions, and frequently return, with good results, to a stallion who had produced a racehorse with a particular mare, after the earlier youngster had successfully raced. With few exceptions, there is no evidence he was an advocate of in-breeding or close-in linebreeding. It seems the stallion's accomplishments, aptitude, and progeny, and his conformation's suitability for Maher's mares were the primary criteria for selection; if there were duplicated ancestors in the hoped-for foal's pedigree, such as the Phalaris-Waffles match, well and good, but if not, it did not seem to deter him from breeding to a stallion. He was very consistent about retaining female families for several generations; he would keep a filly, race her at age 2, and if a decent runner, at age 3 as well, then retire her to the stud. If she was a good producer, he would often then sell her dam, and repeat the process in the next generation. Just before the World War I he engaged in a complete overhaul of his broodmare band; it appears that Snoot (dam of Caligula), one of his "experiments," was the only one who was retained in the stud from his early, and less successful efforts at classic breeding. After that, he would periodically introduce a new female line through a new mare, while retaining the daughters or grandaughters of earlier good producers. "Too many who send horses to the sales do not do them well, with the result that they do not make all they are worth. They are not in the way of doing them properly, and they take them in so early that they gain nothing by the natural advantages we possess, viz., the climate and the limestone soil. They used to ask me how I bred such big, strong horses. It was quite simple. Well fed as foals and up to one year old, and then turned out on grass, always getting a feed of oats once a day, and taken in at night when the winter came, and they thus cost very little more to keep than a bullock." He was convinced that the climate and soil in Ireland, particularly at Confey, were the best for raising youngsters, and actually purchased a mare--N.R.A., the dam of Snoot and all her successful progeny--to prove it. Abram Hewitt, an owner and breeder associated with Ksar, Grey Flight and others, but best known today as author of two seminal books on thoroughbred breeding (Sire Lines and The Great Breeders and Their Methods) said about Maher: "The yearlings from his Confey Stud in County Dublin were the strongest and best developed that the author has ever seen. Yet they were neither stall fed nor fat." Maher was highly critical of many jumper breeders, particularly, who would breed a good youngster and send it to the sales without letting it grow up naturally out on grass for several years, where it could get itself fit and strong. He said in 1926, "In the old days the Hartigans, P.F. Dunne, J. O'C. Murphy , myself and scores of others bred horses for chasing which remained on grass till they were three or four years old. They were then taken in, schooled and hunted. I have seen Cloister, Roman Oak, Ilex, Why Not, Citadel, Covert Hack, Covertcoat and hundreds of others out hunting...my point is that it cost them ['chaser breeders] as much to get these animals fit for sales as would keep them for the next two years, and they lose the growth and strength which they would get if let out with cattle..."
Throughout his life Maher promoted Irish breeding and racing, both over fences and on the flat. He was a prominent member of the Irish Turf Club, and served as steward and senior steward of the Irish National Hunt Steeplechase Committee (established in 1869) for a number of years in the 1920s and early '30s, responsible for administering National Hunt races in Ireland; while he was steward, Pari-Mutuel betting was instituted in Ireland. Maher also served as Chairman and Managing Director of the Metropolitan Race Company, which had grown out of the seaside Howth and Baldoyle Race Meeting, established in 1860. It was the first enclosed park in Ireland, and the 1 - 1/2 mile Baldoyle Derby, established to rival the Irish Derby at the Curragh, and which it for some years eclipsed, was first held there in 1874. The meet gained such prominence that it was incorporated in 1891 as the Metropolitan Race Company, Ltd. Maher was also chairman of the Conyngham Club for several years, and in the early 1920s served as a judge for major shows of the Hunter Improvement Society in England. Irish-bred winners of the Grand National at Aintree have been more typical than not, since its inception, thus Maher's two winners, Covertcoat (1913) and one of the "War Nationals" winners, Ballymacad (1917), were the rule, rather than the exception for that famous race. However, Irish-bred winners of the classic races held across the channel were then somewhat less common. Maher produced four of these--Caligula (St. Leger), St. Louis (2,000 Guineas), Manna (Derby Stakes and 2,000 Guineas), Sandwich (2,000 Guineas)--as well as winners of other major races in England, such as Parwiz (City and Suburban Handicap), Royal Minstrel (Craven Stakes, Eclipse Stakes), Qurrat-al-Ain (Queen Mary and Coronation Stakes at Ascot) and in Ireland, such as Snow Maiden and Spiral (both Irish Oaks). It is not a bad record for a breeder said to never have had more than six broodmares at one time. "I'm afraid there will be no more Epsom and Ascot for me..."
In 1933, in increasing ill-health, Maher resigned his stewardship of the INHS; he visited his last December sale at Newmarket that winter, in a wheelchair. In March, he had written to the editors of the Bloodstock Breeder's Review, "I have been very ill for about 18 weeks. I hadn't a hope of pulling through....I'm afraid there will be no more Epsom and Ascot for me." In the winter of 1934-35, while on a homeward bound cruise with his wife, he died suddenly, age 72, and was taken ashore at Gilbraltar for burial, far from the horses and land that had been his life. Confey Stud continued to operate under his Maher's wife's management and continued to realize high prices at the yearling sales. It was intended that Maher's nephew, William (Jerry) Shiel would assume management of the stud, but World War II intervened when, in 1945, after four years of fighting in Egypt, Italy, France and Germany, then-Brigadier Shiel died after stepping on a land mine in Germany not long after Germany's surrender. After this tragedy, Maher's widow, who had been awaiting Shiel's return and the assumption of the stud's management, decided to sell Confey and its remaining bloodstock. In October of 1945 the 193 acres of limestone-rich farm Maher had such faith in was sold at auction for £14,500 to Mr. McVey of the Wood Park Stud Company of County Meath. At Newmarket December,1945, Confey's last bloodstock was sold for a total of 48,910 guineas for eight mares and five foals. The highest price paid was for Wayfare, a daughter of Waffles, in foal to Big Game. ©1997 - 2005 Patricia Erigero. All rights reserved.